On the shores of the Adventfjord and backed by steep mountains and glaciers, Longyearbyen is the northernmost, permanently inhabited, city in the world. It is a destination with immense appeal for nature lovers and for Aurora hunters. During the dark winter months (Nov to Feb) the twinkling of stars and moonlight illuminates the scene twenty-four hours a day. At this time the colourful waves of the Aurora Borealis can be observed in the middle of the day, and the frozen landscape sparkles like a thousand diamonds. On arrival at Longyearbyen airport, self-transfer to the Basecamp Hotel in the centre of the city using the airport bus service. Tonight, we have included a three hour wilderness dinner at a traditional hunting cabin on the outskirts of Longyearbyen. 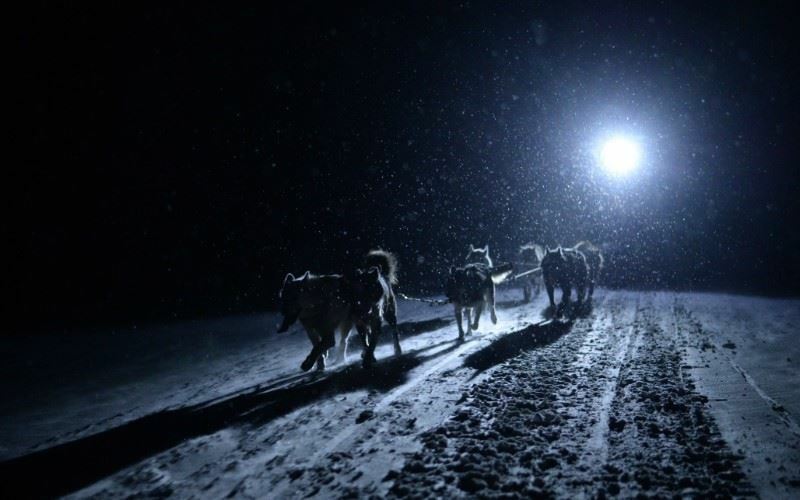 The evening's menu has been developed to convey the history behind the hunters’ lives and cuisine, and during the course of the evening your guide will tell you about the history of Svalbard and the lives of the trappers in the archipelago. The peaceful and relaxed atmosphere at the Trapper’s Station allows you to escape every day stresses and enjoy the small things in life – such as delicious food! Away from the artificial lights of Longyearbyen, you will also enjoy the optimum conditions for a sighting of the Aurora Borealis. Today we have included a dog-sled tour in the Bolter Valley or a guided hike (the choice of activity is determined by the amount of snow on the ground and the weather conditions). Both full day experiences will take you away from the civilisation of Longyearbyen into the high Arctic wilds. Here you will be at one with nature. Listen carefully and you may hear the mountains talking to you, and the calls of nature on the wind. We guarantee that you will be exhilarated by today's activity and, conditions permitting, you may also be blessed by a performance of the Lady Aurora in the skies above. Outside of Longyearbyen's city limits, you must be accompanied by a guide at all times. This is partly because of the wildlife who call the archipelago their home, but in large it is because this extreme arctic environment should be taken seriously. Svalbard is not a 'tourist attraction' it is one of the remotest outposts in the world, 1000km south of the North Pole. Today, we have included a guided glacial hike and a snowshoeing experience. Keep your eyes peeled for the paw prints of the polar fox, Svalbard reindeer and even polar bear. Take time to pause and enjoy the breathtaking silence of the polar night, a memory and a feeling which will live on with you forever. After breakfast self-transfer to Longyearbyen airport using the airport bus service for your return flight home.